ZTE: it’s not a name you hear often, but they’re one of the best selling low-end Android phone makers in the U.S. Those pay-as-you-go phones you’ve spotted at the store with carrier branding all over them? Many of those devices are made by this Chinese manufacturer, though the company is hoping to expand its business beyond just the prepaid and budget markets. ZTE didn’t reveal its plans for any new flagship phones this year at CES, but it did introduce two new devices that it hopes will entice those looking for cheap smartphone options. These phones are so cheap, they even beat out Motorola’s low-end price points. The company also announced “Z Community” in an attempt to wrangle in those numerous low-end customers and figure out what it is they actually want from an affordable, high-end device. A low-end phone that’s pretty mid-range in its performance. The Grand X 3 is the first of the bunch. It’s a $129 phone with a 5.5-inch display, a 1.3GHz Quad-Core processor, an 8-megapixel rear-facing camera, and a 3080 mAh battery pack. The phone also features USB Type-C, rapid charging provided by Texas Instruments, an expansion slot, and Dolby Audio speakers—features that you don’t typically get in a phone at this price point. The Grand X 3’s camera app comes with a feature that snaps a photo every time you smile. The Grand X 3 isn’t particularly remarkable in any sense, but it does feel nice to hold, particularly given its low price point. It’s speedy and responsive, and its camera seems quite capable. There’s even a cute little feature that snaps your photo when you smile. Now this is a cheap looking phone. 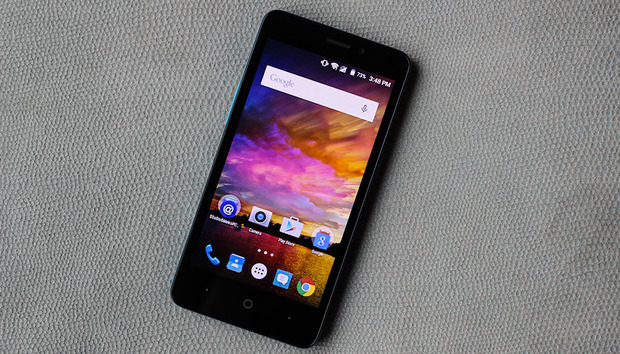 The ZTE Avid Plus is the next option. The phone costs under $50—and it certainly looks like it, too. The phone features a 5-inch display with gnarly, washed-out viewing angles, a 1.1GHz quad-core processor, 1GB of RAM, 8GB of onboard storage, and an expansion slot. There’s also a 5-megapixel rear-shooter. It shoots photos, but they’re not particularly high resolution—which might not matter to you if all you want is basic smartphone functionality. The Avid Plus is as low-end as smartphones get, though there are some perks to choosing this particular device over, say, a $25 Firefox phone. It directly ties into Google’s services, for one, and it will be available on T-Mobile’s network, so you’ll have access to the carrier’s LTE coverage and WiFi calling capabilities. That’s not a bad deal for $50. Like the Xiaomis and OnePlusses before them, ZTE has decided that the smartest move for branding would be to create a community for its active users. The Z Community will include “like-minded individuals helping each other out with support,” according to Andrew Elliott, Vice President of Strategic Marketing. The company also hopes to tap into this community of 22.5 million projected users to figure out what it is exactly they want out of a flagship device—or any device, should they choose something besides a phone. “Any good consumer-facing company is doing this no matter what,” said Elliot. “We were doing that as part of the design of the [flagship] Axon to begin with.” Eventually, ZTE hopes that all that crowd-sourced data will help it put together its next best seller.